I realized recently I haven't done a, "Flashback Friday" post in awhile, on a comic, game, or anything in particular. I want to rectify this so I have a few posts I'm mulling over to give any readers craving some nostalgia a fix. With that in mind I present the first collection of a comic that originally came out self-published, then was picked-up by Avatar and given some tweaks, before the original creator, Mike Wolfer, went back to spruce it up a bit and release its, "Archives," over 4 volumes. I'm a fan of Wolfer's work, often discussing his self-publishing ventures and Kickstarters, so when I inquired about purchasing the "Widow Archives" and reviewing them he was more than happy to shoot-over a digital review copy of the 1st volume for me to give a look-over. I'm glad he did because other than some minor annoyances I quite enjoyed this debut of Widow. even if sometimes the art struggles in this early volume. Let's get the biggest issue out of the way first, the art can be a bit rough in spots. Wolfer has been working at doing comics for decades now and this is from earlier in his career, so even though things are never outright ugly (well, except for the monsters that are supposed to be hideous) things can feel a little scratchier and at times. Nowadays Wolfer of course makes stellar art and even the later volumes of Widow ramp-up in art quality to his present-day quality, but if you're someone who refuses to read comics that aren't utterly gorgeous you're already missing out on other great stuff with less-than-awesome art and you may struggle to enjoy this first volume when compared to the later ones. If someone is rich, isolated from society, and has a huge mysterious lab, run! Putting that aside though, I quite enjoyed the story of this first volume. Two FBI agents end up on a mysterious island after a drug-bust on a boat goes awry and meet a rich and obviously crazy scientist Langford Harrow who takes them in and offers to put them on a ride back to the mainland when a boat of his supplies arrives. Harrow also has a beautiful daughter named Emma with a unique illness that precludes her from living in normal society. The allusions to Dr. Moreau are clear and intentional. I would say the two agents/protagonists of the story are distrustful of Harrow from the moment they wake up in his mansion, but if they had been even more paranoid things might have turned out a bit less gruesome (although that would have made for a duller story, so hooray for over-trusting madmen who alter genes)! The story moves at a good clip with a nice balance of romance (between Emma and an agent named Taggert) and scary imagery (something on the island is murdering people violently). The agents and Emma are well fleshed-out, with Emma especially at first seeming like she is just a boring and horny side-character before as the story goes on we grow to really care about her and have empathy for her plight--seeing as how the later books build-off of the big conclusion of this one, Emma actually has spider-genes and is the main monster causing trouble on the island, sorry if you're mad about spoilers, but the book is named, "Widow," and has her on the cover, so I respect a blog-reader's intelligence enough to figure it out. 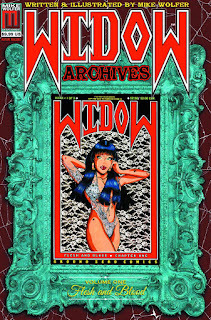 All-in-all the first volume of the "Widow Archives" is quite enjoyable and serves as a solid start to the saga of Emma/Widow. As long as readers can look past the sometimes-iffy art in this first volume fun is sure to be had, and I'm excited to further dig-in to the later volumes for sure!